Seems growing consumer demand to rent a private yacht in a unique destination has prompted another superyacht owner to relocate for the upcoming winter season. relocate to the Indian Ocean, word comes that the 228-foot motor yacht SHERAKHAN will relocate to Antarctica this winter. Motoryacht SHERAKHAN first visited Antarctica in 2010. Her return trip will be in January and February 2013, with two confirmed charters on the books. The superyacht will remain in Antarctica during March 2013 if there is additional charter interest. Another option the owner is considering is a relocation to Chile, Patagonia, or the Brazilian Amazon to accommodate requests for charters through April. In May, the megayacht will travel to the Mediterranean for the summer 2013 charter season. 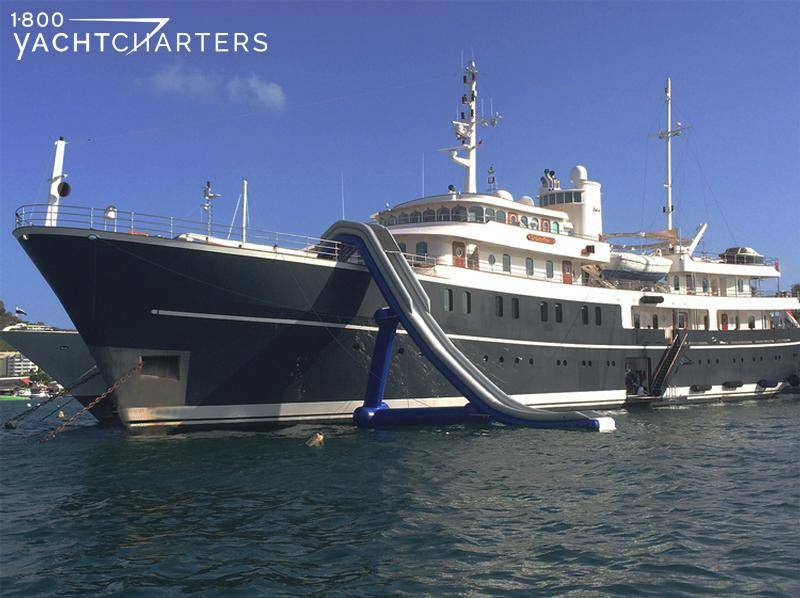 This custom-built 70 meter vessel is ideal for large families or corporate incentive charters, as she is able to accommodate as many as 26 guests. Amenities include a spa deck, an impressive two-level dining room, and an extra-large hot tub on the sun deck. 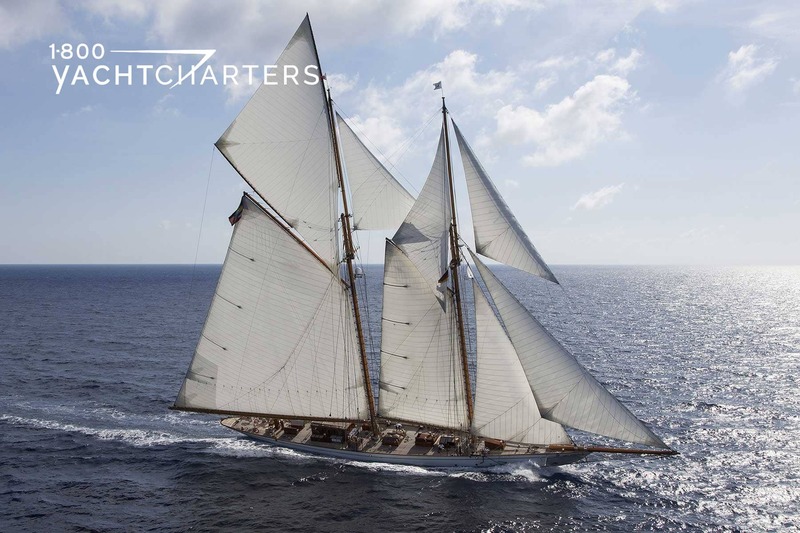 Lovers of classic sailboats take delight – the spectacular sail yacht GERMANIA NOVA has announced plans to reposition in time for the Caribbean yacht charter winter season. “We want to thank you and your amazing Crew for a trip of a lifetime. Our 8 days aboard motor yacht SHERAKHAN will forever be remembered and revered as beyond exceptional. We decided to charter SHERAKHAN because of the ship’s ability to sleep more than twenty guests and the crew was to be amazing. I would like to confirm that the ship is beyond beautiful and the crew is beyond anything I have ever experienced. Chefs Mark and Michael were incredible, we never wanted to eat a meal off the boat the food was so delicious! Every morning we looked forward to seeing the incredible fruit and vegetable sculptures at the buffet table. We played water sports until we couldn’t stand, had amazing massages, and played in the glass-bottom Jacuzzi. We sang Karaoke until we couldn’t sing and danced the night away under the moon and the stars. I want to say a very heartfelt thank you to each and every member of the crew – some I only saw once or twice – others all day every day. Thank you all so much for your hard work and all of the love you put into making sure we had a trip of a lifetime. Motoryacht SHERAKHAN and her amazing sundeck and hot tub, first caught attention on our blog in November 2011, when we rated the top 5 on-deck tubs on charter vessels. The 228 foot motor yacht SHERAKHAN is extremely popular with large extended families, as she is one of a select few vessels with the capacity to accommodate 20 to 26 guests. This spacious yacht is now in the shipyard and finishing her winter maintenance work before relocating to the islands for the start of the Caribbean yacht charter season. Improvements include all new deck furniture and new carpets throughout. Watertoys are all either being replaced or serviced to as-new condition. The Bimini cover above the on-deck hot tub is being adapted to give more shade options and large modern shade parasols are being installed on the sun deck. Yacht SHERAKHAN is available from mid-November in the Caribbean, including Thanksgiving and the Christmas/Hanukkah/New Year holidays. Contact 1-800 Yacht Charters at https://www.1800yachtcharters.com/book-now-contact-us/ to arrange your own memorable vacation aboard superyacht SHERAKHAN. Message to Caribbean Yacht Charter Fleet: Go Green to Save the Blue! 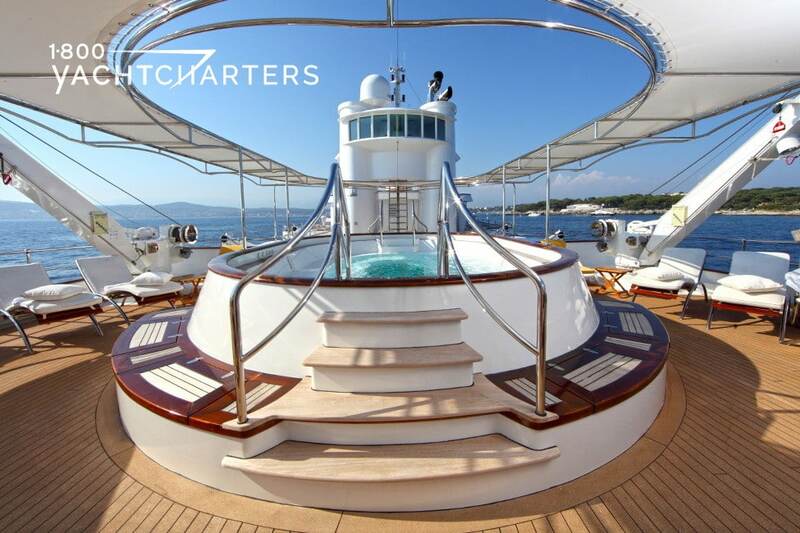 An association of charter brokers has announced an award to recognize luxury sailing charter vessels who adopt eco-friendly practices. 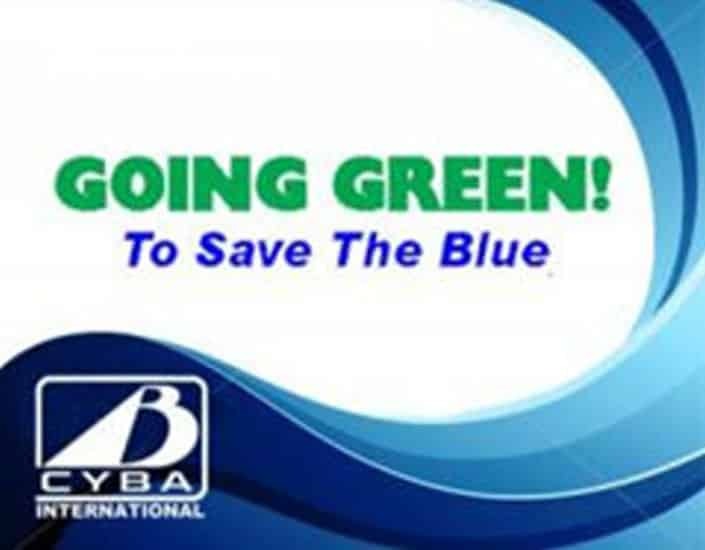 The Charter Yacht Brokers Association International (CYBA) has launched the 2012 “Save the Blue” awards, as a continuation of the organization’s green initiative to reduce plastic water bottle waste by encouraging yachts to produce their own onboard purified drinking water. Vessels available for charter can qualify for the award by meeting at least seven of the thirty criteria that CYBA has listed in an online survey. Many of the criteria are simple to implement and include green practices such as using biodegradable cleaners, buying sustainable seafood, and using recyclable shopping bags. Jana Sheeder, President of 1-800 Yacht Charters and SailAway Yacht Charter Consultants praised the effort. CYBA is hopeful these awards will inspire captains, crews and owners to take more steps toward going green. Vessels that qualify will be recognized at the upcoming charter industry winter shows in St. Thomas, Tortola, and Antigua. The owner of the 72 meter motor yacht TITANIA has announced a unique itinerary, along with a special reduced rate for a two week cruise. Fusing together Eastern and Western Mediterranean cultures, superyacht TITANIA is set to embark upon a 2-week odyssey from Naples, Italy to Istanbul, Turkey, October 6 to 22, 2012.Charter guests can visit and explore the magical islands of Stromboli, Corfu, Santorini, Crete, Mykonos and Rhodes. For this special itinerary and these set dates, the owner has reduced the charter price from the published weekly rate of €550,000 per week to €350,000 – a 36% reduction. At 72 meters, M/Y TITANIA is the perfect yacht for extended cruising. With seven stunning staterooms, including two magnificent master suites she comfortably accommodates up to 12 guests in complete luxury. With two full-time experienced chefs on board, yacht TITANIA can cater to most discerning client’s needs.This Lurssen yacht charter vessel also offers the services of a beautician and a personal fitness instructor. An extensive inventory of watersports equipment is guaranteed to bring out the child in everyone.